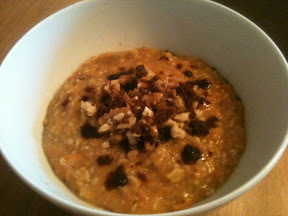 I love porridge and I love carrot cake so when I saw this rather unusual recipe from @porridgelady I had to give it a go. I know putting carrot in porridge sounds a bit strange but it takes fab in carrot cake so seemed worth a go! My version is a bit of an adaptation but was very yummy and relatively healthy. I decided I wanted to make it all in one pan so I grated the carrot into a saucepan, added a splash of orange juice, the dried fruit and the spices (plus sugar if desired, leave out to keep it clean) and cooked for a few minutes until it started to soften. I then added jumbo porridge oats, a little bran and the water and the milk. I cooked slowly until the oats started to break down and it looked nice and creamy and served with a sprinkle of walnuts and soft dark brown sugar. A small handful of sultanas or your chosen dried fruit. I also added a little chopped crystallised ginger (use fresh to keep it clean). 2. Add the oats, bran (if using), milk and water and cook on a low heat until the oats are starting to break down and the mixture is fairly thick and creamy. 3. Pour into a bowl and serve with a sprinkle of walnuts and soft dark brown sugar. If you're feeling particularly decedent a splash of single cream would go very well I'm sure.